The United Nations, which reflects the will of international community, never was and never can be apart from the Armenia-Azerbaijan Nagorno-Karabakh conflict’s resolution process. 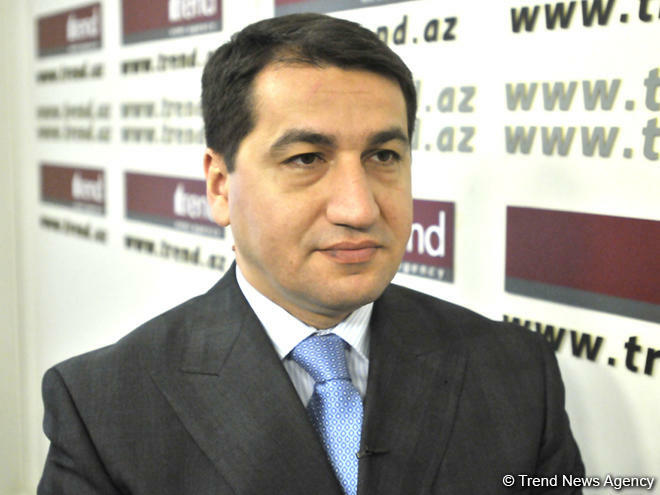 Azerbaijani Foreign Ministry Spokesman Hikmat Hajiyev made the remark in an interview with Trend on March 27, adding that international peace and security are the priority tasks of the UN according to its charter. Use of force against the territorial integrity and sovereignty of states and acts of aggression are prohibited according to the Charter of the UN, he said. Armenia’s pretending to be committed to the UN Charter at the level of foreign minister is nothing but hypocrisy and an attempt to mislead the international community, Hajiyev added. In a press statement Feb. 27, 2017, the UN secretary general urged the resumption of substantive negotiations leading to a peaceful settlement of the Armenia-Azerbaijan Nagorno-Karabakh conflict without delay, Hajiyev said. “At the same time, we support the UN secretary general’s Jan. 1 appeal for peace and his initiative of declaring 2017 the year of peace,” Hajiyev said. In his appeal, the UN secretary general also called for ceasefire and compromise in the negotiations for the conflict’s peaceful settlement, Hajiyev added. It is regrettable that as a result of Armenia’s policy of maintaining the status quo of occupation and continuing annexation of Azerbaijan’s territories, the ceasefire regime since 1994 has not been transformed into the political solution and sustainable peace, he said. “Armenia continues to misuse the ceasefire regime for consolidating occupation and by all means undermines the efforts to achieve progress in the negotiations,” he noted. Armenia’s deviation from the substantive talks and its policy of boycotting and putting pre-conditions to the negotiations over the conflict’s peaceful settlement is proceeding from this fact, Hajiyev said. Armenia understands well that the essence and end-goal of substantive talks is to change the status quo of the occupation on a step-by-step basis, he noted. “In 1993, the UN Security Council unanimously adopted four resolutions (No. 822, 853, 874 and 884), condemning the occupation of the territories of Azerbaijan, reaffirming respect for its sovereignty and territorial integrity, the inviolability of international borders and the inadmissibility of the use of force for the acquisition of territory,” Hajiyev said. In the resolution No. 873, the Council welcomed and commended the ‘Adjusted timetable of urgent steps to implement Security Council resolutions 822 and 853’, he said. The adjusted timetable prepared under the mandate of resolution No. 853 envisaged withdrawal of armed forces of Armenia within concrete timeframe from the occupied territories of Azerbaijan, he noted. The UN Security Council also tasked the OSCE to ensure the implementation of the resolutions when performing its mediation efforts towards the settlement of the conflict, Hajiyev added. The final paragraph of the resolution No. 884 of the UN Security Council reiterates that the secretary general continues to report to the Council on the progress of the Minsk process and on all aspects of the situation on the ground, Hajiyev said. “The OSCE Budapest document of 1995 on mandate of the OSCE Minsk Group co-chairs also confirms that the mandate of the co-chairs is based on the principles of international law, the Helsinki Final Act and the UN Security Council resolutions,” he noted. The UN secretary general in the press release dated Oct. 31, 1994, made it crystal clear that “the position of the United Nations is based on four principles which have been mentioned in the different resolutions of the Security Council,” Hajiyev added. “The first principle is the territorial integrity of Azerbaijan, the second principle is the inviolability of the international boundaries, the third principle is the inadmissibility of the use of force for the acquisition of territory, and the fourth principle is the immediate and unconditional withdrawal of all foreign troops from occupied territories of Azerbaijan,” he said. “The UN and specialized agencies were also actively involved to support Azerbaijan in overcoming the consequences of humanitarian catastrophe which Azerbaijan faced as a result of the conflict,” he said. “In this regard, we particularly appreciate the role and support of the United Nations High Commissioner for Refugees (UNHCR) in alleviating the humanitarian situation of more than one million Azerbaijani refugees and IDPs,” Hajiyev added. Based on the UN Security Council resolutions, the efforts of OSCE Minsk Group co-chairs must be redoubled, Armenia must be urged to return to the substantive talks and must be demanded to abide by its obligations under the international law and the UN Security Council resolutions for the settlement of the Nagorno-Karabakh conflict, he said. “We are hopeful that 2017, as declared the year of peace by the UN secretary general, will be the end of the continuing occupation of Azerbaijan’s territories by Armenia and will also be the beginning of the lasting peace in the region through substantive negotiations,” he added.